Choose the services you need to create a fresh, clean look for the summer. We put a fresh edge on all the beds based on your preference and always contact MISS DIG for safety. 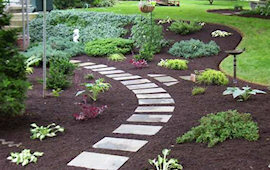 Choose the type of mulch you prefer, we usually recommend hard wood, double-processed mulch throughout all gardens. We mulch behind bushes and hard-to-reach places. We put a fresh topping of mulch in all the beds, approximately two inches deep to keep weeds under control and dispose of all debris we collected. Choose the Fall Cleanup services you need to preserve your lawn and landscape through the harsh winter months. We remove fallen branches, twigs, and debris. We blow-out the leaves and light debris, including the areas behind bushes and hard-to-reach places. We blow down into the grass and soil to bring up the debris clinging to the base of the lawn. When the blowers cannot bring up leaves and debris in the moist areas, we rake up the leaves into piles and dispose of them. 4 Seasons Outdoors can take care of tree and shrub trimming and weed control throughout the growing season. Call (810) 845-3543, (810) 252-0529, or contact us online to set up a free landscape maintenance estimate.